Fernando Alonso was airlifted to the hospital after crashing his McLaren in preseason testing at Barcelona earlier today. 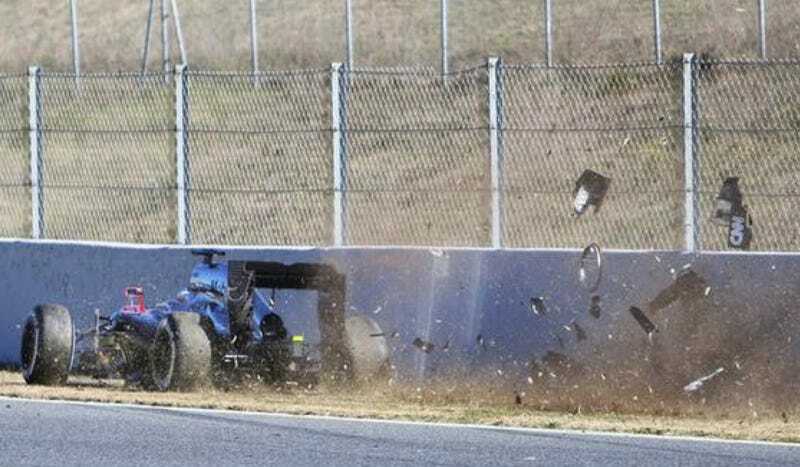 He went off at Circuit de Barcelona-Catalunya's Turn 3, smacking the right side of the car hard. McLaren race director Eric Boullier confirms that he was concussed in the accident. Autoweek reports that Alonso "was conscious and spoke with the doctors" according to the staff in the medical center at Catalunya, however, it was standard procedure to airlift him to the hospital for a wreck of this nature. According to NBC Sports reporter Luke Smith, Alonso will remain in the hospital overnight for observation. According to BBC Sport, medical scans found no signs of injury. McLaren officials and the track have not given a reason for Alonso's crash. No one is sure if something broke on the car or driver error was the cause. BBC Sport also reported that Sebastian Vettel had been following Alonso at the time and reported that the crash looked bizarre. "The speed was slow - maybe 150kph [93 mph]. Then he turned right into the wall. It looked strange," he told them. Testing resumed at the track after a slight delay following a lunch break. McLaren, however, called it a day. Jenson Button was supposed to test out the car after Alonso, but opted not to throw it back together for today.